My friendship with the Australian Albert's Basement label has been long-standing and buoyed by a good deal of mutual respect. That said, in the last year or so they have truly hit their stride, release upon release further articulating their vision of Australian music from the fringe. Frequent reviews at Volcanic Tongue and at the Siltblog provides further evidence that heads are beginning to turn. 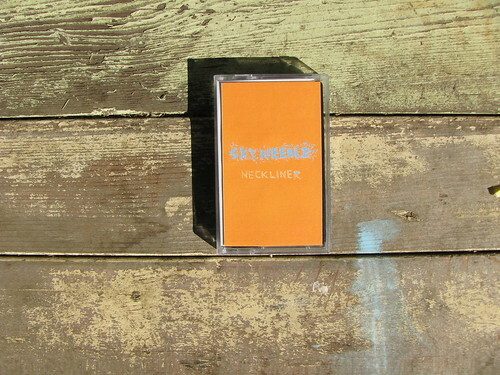 So I present you with Neckliner, the new tape by this Brisbane four-piece. Have not heard anything from Brisbane in recent memory, which leads me to believe this group has been free to develop their wholly unique sound free from the usual pressures to conform to a scene. Pop music in that the snare lands on the downbeat and that the vocals are upfront, but what a strange beast Sarah Byrne's vocals are, lithe and wordless, making strange figures in the air, and there's also that saxophone to account for, freely providing dissonance and skronk. But aside from some passages of scrabbling improvisation, this isn't wild, indulgent music -- actually reminds me a lot of a looser, more organic Art Bears, minus their rock and roll indulgences. Fresh new sounds from Australia, cool stuff for sure. $7, email eggyrecords@gmail.com to order it.